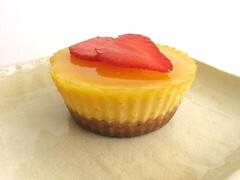 Mango Cheesecake - Do You Know The Muffin Man? Notes: I had about 2 cups of mango puree in the freezer so I decided to make this for a BBQ I was invited to. The recipe is pretty simple; my only additions were a bit of ground almonds in the crust and a reduction in the sugar for the filling as the fruit was quite sweet. 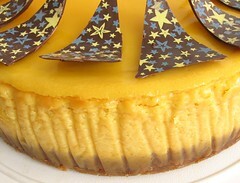 I also made some mini-cheesecakes as my pan was only 8". 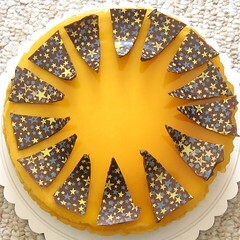 To finish off the dessert, I made a miroir glaze from fresh mangoes and decorated the top with some chocolate shapes. Using a patterned transfer sheet, I spread melted chocolate on the surface, and before it hardened, cut the triangles out and draped the whole thing on a rolling pin. Great mango flavour, especially from the gelatin topping as it dissolves in your mouth.